Gon is a small dinosaur that has managed to survive extinction. He goes on fun adventures in a world of vibrant creatures and fauna. SIZE DOESN'T MATTER. BIG TROUBLE COMES IN A LITTLE PACKAGE! 65 million years ago, dinosaurs experienced aw catastrophic extinction that ended their dominance on Earth except for one! 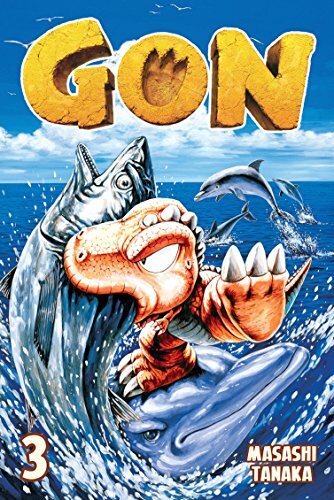 In this volume, Gon frolics with some watery friends until a school of piranhas tries to put the bite on him. Later, Gon leads a pack of baby wolf cubs to seek revenge against a vicious tiger for the death of their mother. And get ready for far-out fun in the forest, as Gon consumes massive quantities of mushrooms! Includes special extras after the story! If you have any questions about this product by Kodansha Comics, contact us by completing and submitting the form below. If you are looking for a specif part number, please include it with your message.